For years A-Class Catamaran World Championship regattas have been capped events. Yet as the fleet has grown from hosting championship events of around 75 competitors in the late 1990s to now pushing triple digits, regatta organizers have found in it necessary to cap events at 100, and if potential competitors did not submit their registration forms well in advance their options were either to hope for the best from the wait list or try again next year. Things are different this time around as the first truly open World Championship in A-Class history kicks off on Monday with Race One of 2012 Ronstan A-Class Catamaran World Championship. Last year in Aarhus, Denmark regatta organisers capped the 2011 Worlds at 100, though a few no-shows brought numbers down to 96 boats on the line. The 2012 Worlds currently boasts an entry list of 115, with as many as 118 boats expected on the line, a challenge for Principal Race Officer Billy Richnow. Thankfully there is no shortage of sea room south of the Florida Keys, and while Islamorada’s Islander Resort, the event headquarters, is booked to capacity conditions look perfect for the largest A-Cat event ever. Yet the massive numbers aren’t expected to have an impact on the quality of racing, with things looking very crowded at the top thanks to entries from a bevy of high quality competitors. Current World Champion Steve Brewin is expected to be pressed from all sides with Australia’s Jack Benson, Andrew Landenberger and Brad Collet all fresh of top five finishes in 2011 and raring for another shot. Meanwhile United States based Australian ex-patriot Ben Moon, New Zealand’s Mike Drummond, and Germany’s Bob Baier are all coming off top ten finishes, and current European Champion Chris Fields of Great Britain finished just outside the top ten with an 11th in Aarhus. However the 2012 Worlds aren’t expected to just be a repeat of 2011 on a larger scale. Americans Lars Guck and Matt Struble are checking in on the world scene for the first time since 2008. 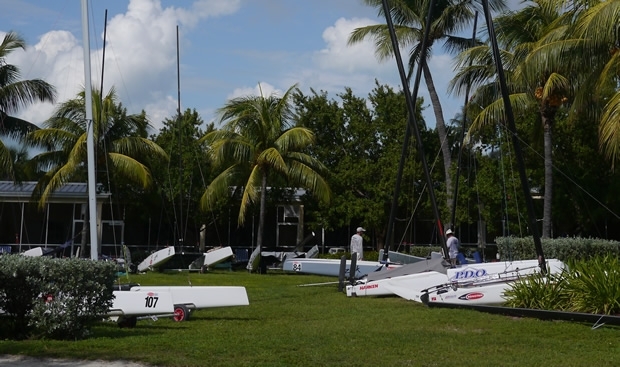 Both Guck and Struble sailed the 2011 event in chartered boats, but have not competed on an international stage in boats of their own since the last time the Worlds came to Islamorada in 2007, when Guck finished second by two points to Glen Ashby. And as if that weren’t interesting enough now Artemis Racing’s Nathan Outteridge has thrown his hat into the ring. Fresh off a gold medal in the 49er at the London Olympics Outteridge is now ready to try his hand at the A-Cat, though it should be noted that while still relatively new to the Class, Outteridge did finish second at the 2012 Australian Nationals, and will be facing off again with fellow 49er Olympian Blair Tuke of New Zealand, who finished second to Outteridge in London. While racing runs from 22-26 October with the 27th reserved as a weather date, headlines will start on the 20th on day one of measurement and registration. After all the A-Class is one of the last true development classes, with the only design restriction being minimum weight (75kg) and maximum length (5.49m), beam (2.3m), and sail area (13.94sqm). Seemingly every other year a new development takes the international fleet by storm. At the 1999 Worlds in McCrae, Australia Germany’s Nils Bunkenburg set the world on fire by taking home first place with his wave piercing bows. In 2011 Brewin won the Worlds with curved dagger boards, a concept first worked out by Baier a few years before. Now Landenberger and Oliver Moore of the United States both have T-foils on their rudders, an idea first attempted by Steve Clark at the 2002 Worlds in Martha’s Vineyard. Regatta organisers estimate that there may be as many as 15 different designs on the line, though they wont know for sure until measurement concludes on Sunday. 118 A-Cats on one starting line. 118 A-Cat sailors in one hotel.